There are very few well-located hotels in Meribel, the Chalet Hotel Les Grangettes is an exception to the rule, it’s across the road from the Chaudanne ski lifts making getting first lifts no problem, assuming you haven’t spent too long in Meribar the night before! Other hotels in area are at a higher star rating but will be at least 3 times the price. The rooms are a decent size and the staff are always very nice. One of the best located hotels in Meribel and the bar below which often has apres bands playing is always busy. Try and get a room towards the back of the hotel if you can, to make sure you don’t hear those apres has left behind! The bar has a relaxed atmosphere, English staff and they sell pints. The bar also sells good value food and there’s always plenty going on to keep you entertained. The bar doesn’t stay open late to give the guests a good night sleep. 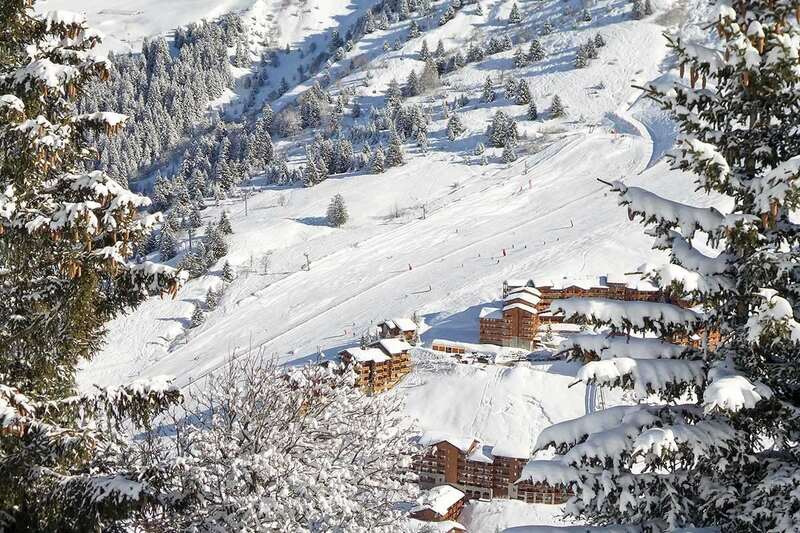 The property has many returning guests as it not only has the best location for the skiing but for everything in Meribel is within walking distance. The chalet staff have 1 night off and the restaurants nearby are fantastic, if you like cheese then a fondue is a must. Jacks Bar is nearby where you can find crazy après and nightlife but there are also plenty of chic bars everywhere else in Meribel. Meribel is in the heart of the 3 Valleys ski area and Chalet Hotel Grangettes might even be the heart of Meribel. We recommend a week’s stay here for a good all round base. This Chalet Hotel is perfectly located just across the street from the main Chaudannes ski lifts and ski school meeting point, with the atmospheric heart of Méribel’s main centre right on hand. The Grangettes’ ground floor comprises reception, where our team are on hand to help you make the most of the facilities, a comfortable lounge and the separate Savoyard style dining room. There is a further small lounge with TV/DVD on the first floor. Our own bar, Méribar, has its own external entrance and is open to all for great value lunches; après-ski drinks, cocktails and theme nights until 11pm (with last orders at 10.30pm). It’s attached to a very popular apres ski bar called Meribar, which has excellent entertainment after a good days skiing. You get approx 2euros discount on every drink at the bar, which adds up to great saving over a week. The rooms are basic, but clean and comfortable. The food was amazing and plenty of it and plenty of wine to wash it down. The chalet workers workers were extremely helpful in every way. The hotel/chalet is located approx 30 metres from the slope and 100 metres from Rhodos gondola. So location is fantastic, and meribel is perfectly located if you want to explore the three valleys. Booking was easy from the start, I was dealing with someone called Alice who was very patient and helpful. Transfer to and from resort was easy too. I have just come back from an excellent holiday in Les Grangettes Meribel. Booking the holiday with iglu was very quick and simple. The accommodation couldn't have been in a better location, 2 mins walk to the ski lift and very good location in town. The accommodation itself was very basic in the rooms however you spend such little time in the rooms it doesn't matter. The food was amazing! Breakfast had an excellent buffet selection and a hot option. Get back at 4pm after a hard days skiing and you can have soup and cake and then at 7pm you have canopies followed by a 3 course meal with unlimited wine. We were sceptical of the free wine but it was great and it was definitely unlimited!! Coming in bottles not out of plastic containers! The evening meal was brilliant from duck to legs of lamb it was all excellent. The staff were all very friendly and helpful and better than most waiters you would find in restaurants. Overall an excellent stay and would definitely book again.